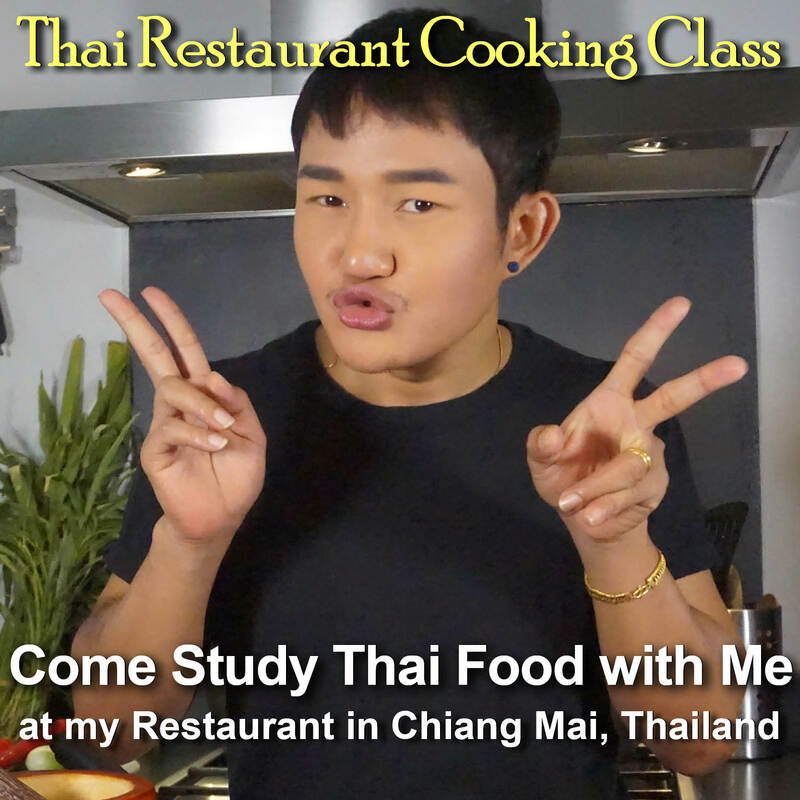 This delicious and easy to prepare Thai stir fry has a light but flavorful sauce made with garlic and brown sugar, with just a little oyster sauce, light soy sauce, and fish sauce for an authentic Thai flavor. 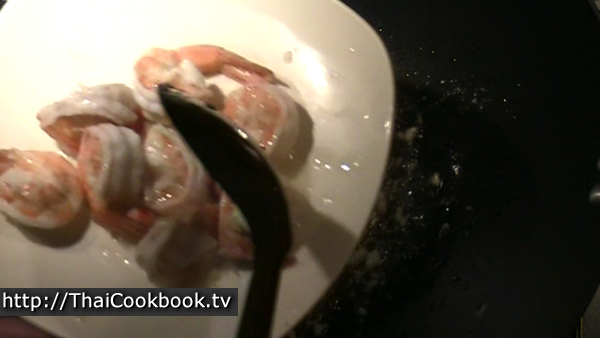 The shrimp are carefully cooked for just the right amount of time so they remain soft and juicy. We use baby corns, straw mushrooms, and green onion for even more flavor, but you can substitute other types of vegetables such broccoli, kale, etc. for an equally tasty result. 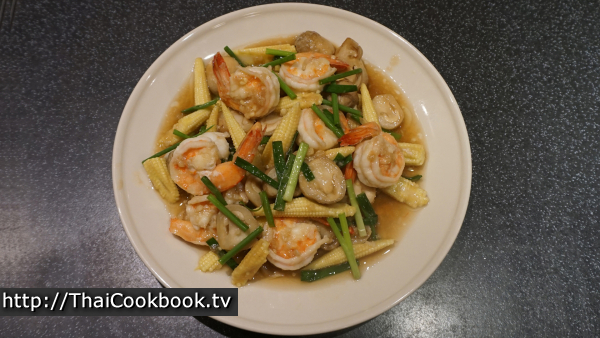 What's in our Stir-fried Shrimp with Baby Corn and Mushrooms. 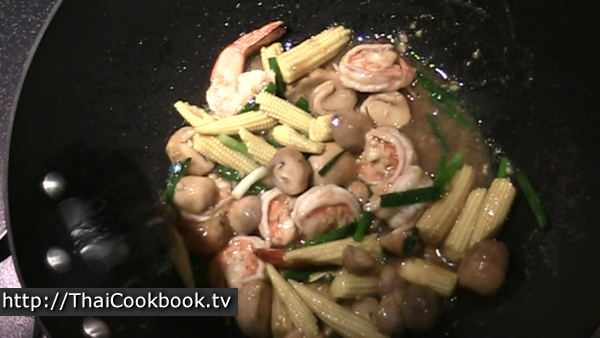 How we make our Stir-fried Shrimp with Baby Corn and Mushrooms. 1) Clean and devein the shrimp. 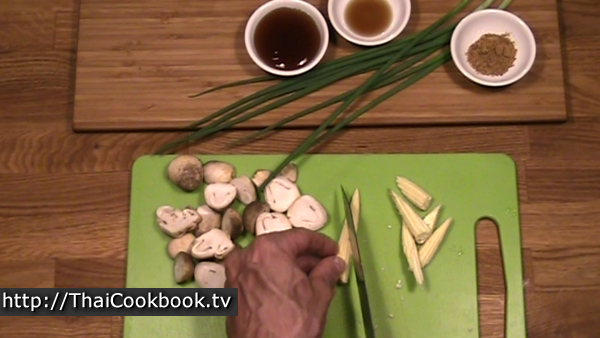 Cut the baby corn, mushroom, and green onion. Chop the garlic and measure the sauces. 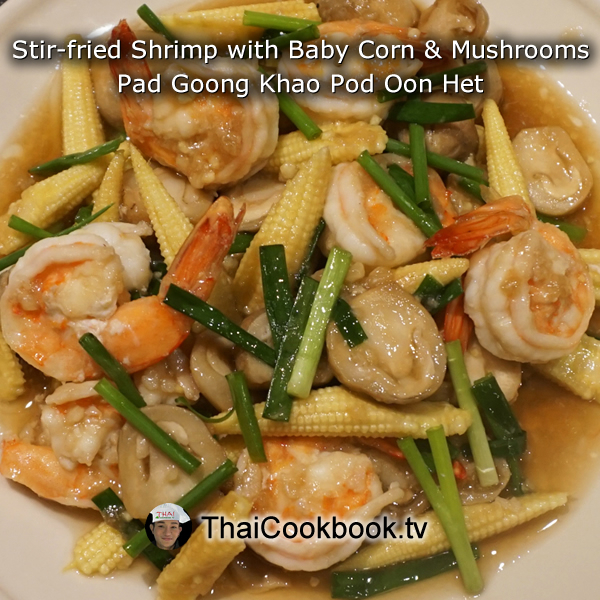 2) Fry the garlic in oil for about 15 - 30 seconds, then add the shrimp and fry them on each side until barely cooked, then remove from the oil and set aside. 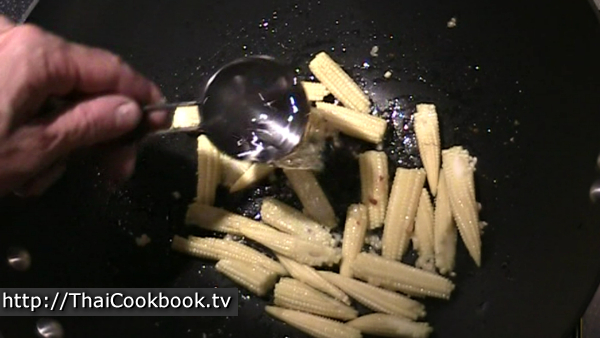 3) Add the baby corn to the pan with 1/4 cup of water. Boil for about 2 minutes, then add the mushrooms, sugar, and sauces. Stir in well and cook for 1 minute. 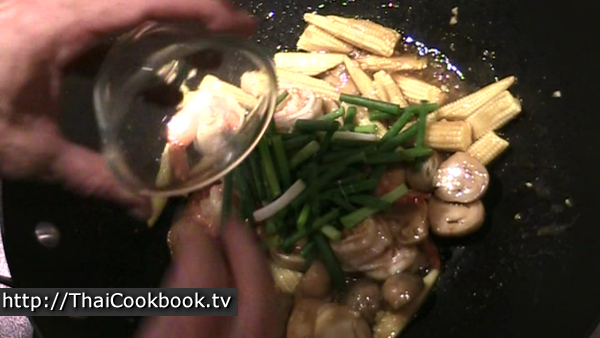 4) Add the shrimp back to the pan, along with the green onion. 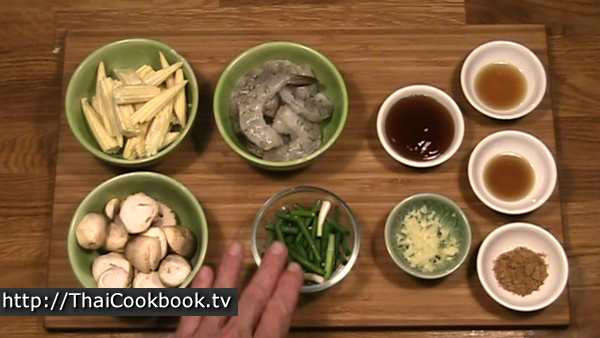 Stir well and turn off the heat, letting the residual heat warm the shrimp and wilt the green onion. Serve immediately. 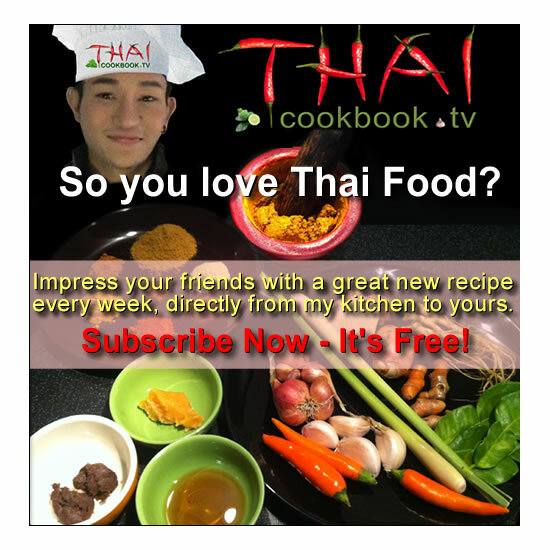 This Thai style stir fry is very easy to prepare. Despite what you may have been told, many stir-fried dishes come out tastier if you take the time to cook them slower over low heat. Here I used the Straw Mushroom, but you can use Shitake or other mushrooms for an equally flavorful result. Just cut them in half, and then cut the baby corns diagonally. If the corn is small, you can leave them whole, but mine here are about 4 inches which is a little long. Cut the green onion into 1 - 2 inch pieces. If not already done, clean and devein the shrimp well. Some people like to leave the heads on the shrimp. You will usually see it this way in Thailand, but here I have removed them since I have some nice big shrimp tails. Chop the garlic very fine or use a garlic press. 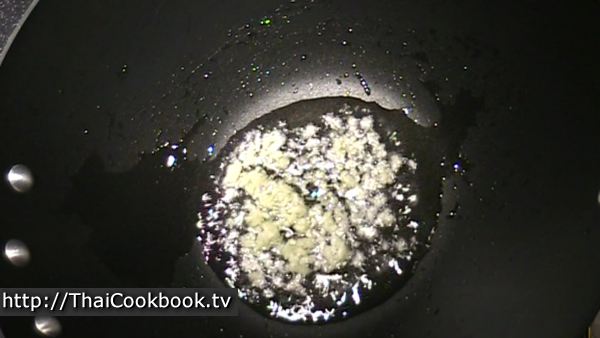 Add one tablespoon of vegetable oil to a wok or frying pan over low to medium heat. Add the garlic and let it warm up and fry slowly for about 30 seconds. 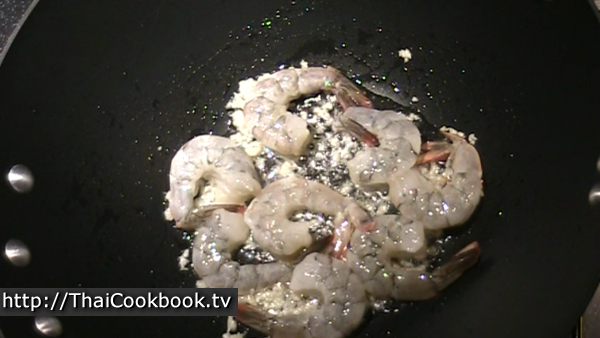 Lay the shrimp out flat in the pan so they are all touching the heat. Fry them on one side for about 30 - 45 seconds only, without stirring, so they are just turning pink and starting to curl. 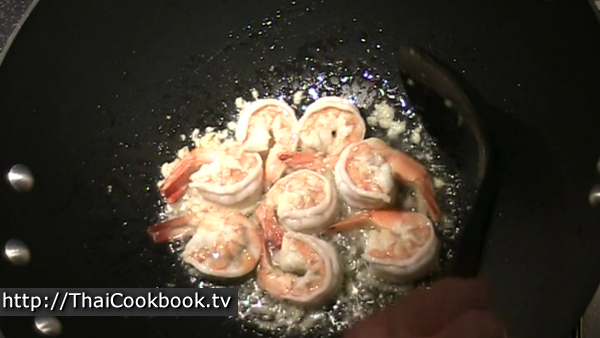 Turn all the shrimp over at the same time and cook for about 30 seconds more, or until they look nearly done. The secret to making this dish come out really nice is to not overcook the shrimp. Remove them from the hot pan before they are fully cooked. Put them on a cold plate and set aside so they stop cooking. Add the corn to the hot pan, then add 1/4 cup of water. It will take about 2 minutes to cook in a little boiling water at the bottom of the pan. Stir often. 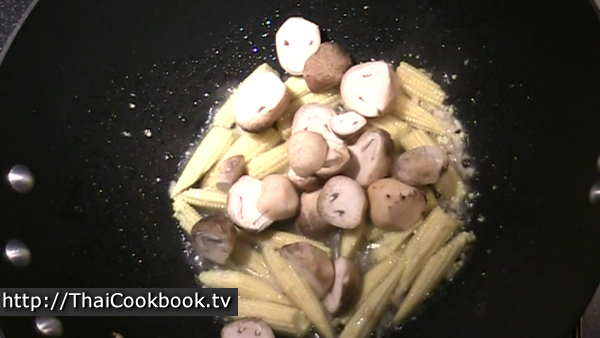 When the corn gets a little soft, add the mushrooms and stir it all well. 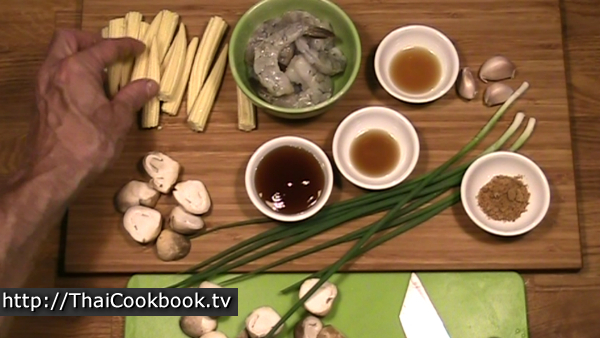 Add the sugar, oyster sauce, fish sauce, and soy sauce. 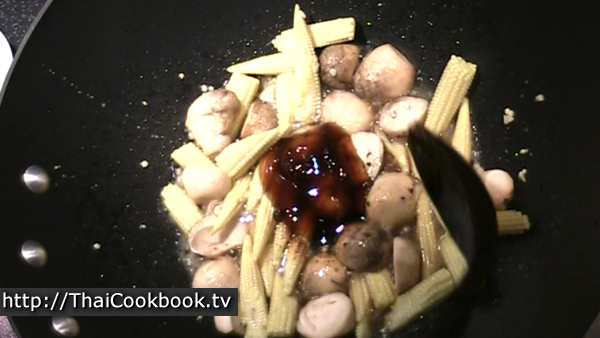 Stir into the water and let it get hot while the sugar melts and creates a nice brown sauce. 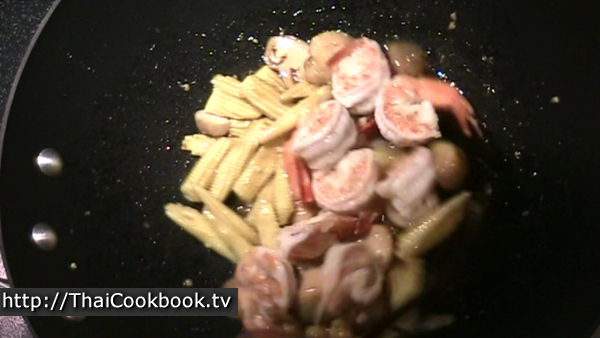 Add the shrimp back to the pan and stir in well. Add the green onions, stir well, and turn off the heat. Let it sizzle and cook just a little as the pan cools down. Really you are just warming the shrimp again and wilting the green onion. Serve immediately. 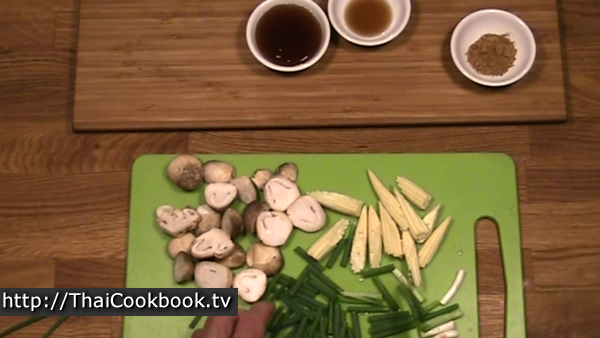 Arrange the ingredients so they are all spread out well, and top with a few pieces of fresh green onion.